Khe Sanh '68 places you in command of United States and South Vietnamese (ARVN) forces in the campaign to relieve the USMC firebase at Khe Sanh during the Vietnam War. The historical campaign was something of a race against time as the US high command feared that the North Vietnamese were going to attempt to overrun the base. 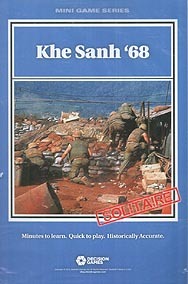 All resources put into the Khe Sanh fight, however, were subtracted from those available to deal with the Tet Offensive elsewhere. Your mission is to extract maximum communist losses while minimizing the allied effort. The game uses the Cold War Blitz series rules, a solitaire game system. You command the US and ARVN units, and have a deck of cards to enhance your unit capabilities. A second deck of cards, drawn randomly one at a time, controls communist (OPFOR) activities. Combat is resolved with a quasi-tactical system with opposing units firing at one another.